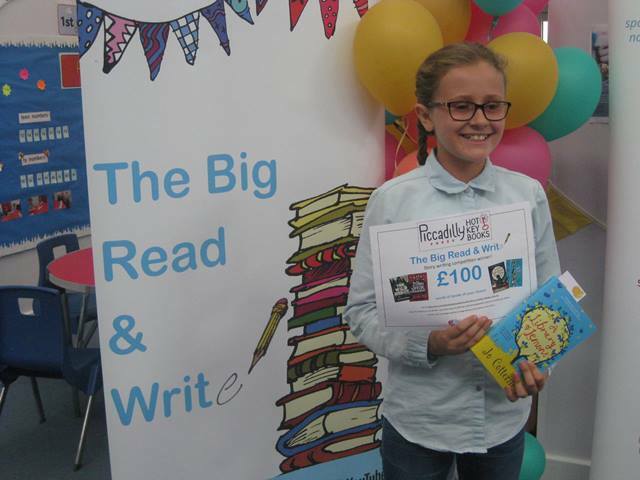 Congratulations to Iris for winning this years Big Read and Write competition with her story “There aren’t plenty of fish in the sea”. 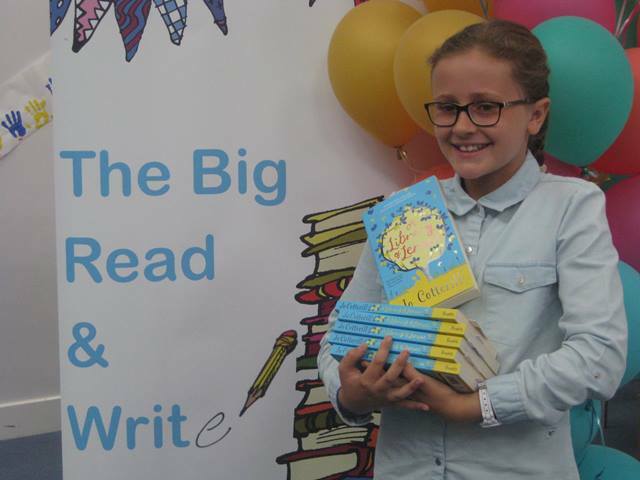 The competition was open to children in year 5 across Cambridgeshire and was judged by author Jo Cotterill. 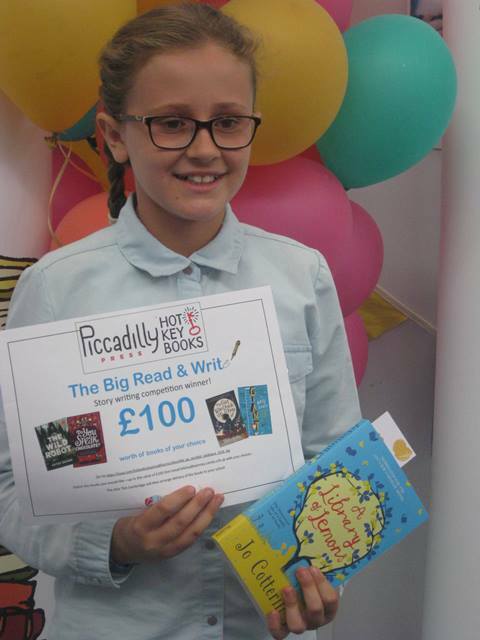 Iris received £100 to spend on books for herself as well as a class set of Jo’s book “A Library of Lemons” at a special award ceremony held at Bewick Bridge Primary School. 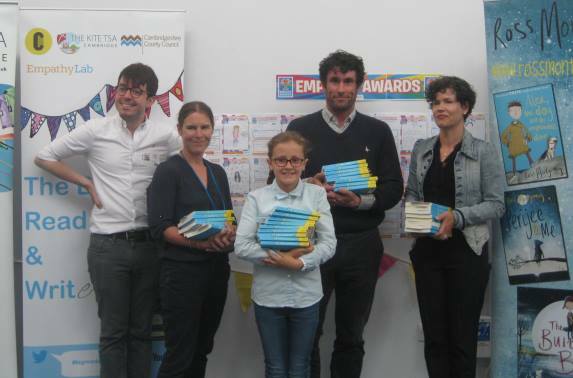 Below are some photos from the presentation and Iris’ winning story. 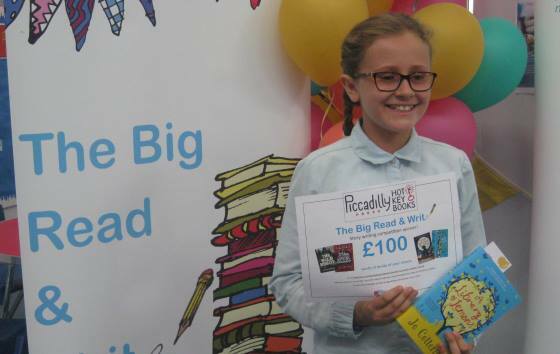 Well done to all who took part in the competition! Twice upon a time there was a mean and grumpy oyster. You could describe him as SHELLFISH! Because he was so mean, he had no friends whatsoever. Plenty of fish in the sea had tried to make friends with him but it never worked. He would throw rocks at them, ignore them completely and pretend they’re invisible. One day, there was a kind-hearted clown fish swimming in the great blue sea, looking for someone to cheer up, when he noticed the grumpy oyster being his usual self: grumpy. The clown fish had heard many stories about how horrible this particular oyster was, but the brave fish was willing to do what he thought was right. He excitedly somersaulted towards him. “Isn’t it a lovely day?” the colourful fish asked at last. “No” scowled the oyster. The fish decided to change the subject, “fancy going for a swim?” “I HATE SWIMMING!” yelled the short-tempered oyster. The innocent fish realised that the oyster was not at all in the mood for small talk. Before the fish could say anything else the oyster shrieked “you know what, out of all of the annoying fish I have ever met, YOU TOP THE LOT! Can you get lost before I make you?” These words hurt the fish. He was only trying to help, why would anyone say such a thing? The next morning, the fish woke up, feeling miserable about the spiteful things the oyster had said. Before, he was certain that he was kind and helpful but now he was beginning to doubt himself. “I think I’d better to talk to him.” And with that he set off. As the sun rose the next morning, the oyster was deep inside his shell when he heard a muffled voice. He carefully opened up his shell and hissed, “Who’s there?” Out of the corner of his eye he saw the brightly coloured clown fish swimming towards him. “Can I talk to you? I just wanted to ask…” it said. “I am really sorry for being mean and grumpy I just got angry when you asked me to go for a swim because I can’t swim because I’m an oyster and oysters can’t swim by themselves so I got angry with you when it’s not your fault I’m so sorry” the oyster blubbered tearfully. He felt so much better now he had got that off his shell. “Wait, who said anything about doing it yourself?” and with that the clown fish put out his fin for the oyster to hold onto and they swam away together far into the deep blue sea. Now the oyster has well and truly learned his lesson. You should be kind to everyone because there aren’t plenty of fish in the sea after all.